The headline and picture says it all. Congrats to Senator Barack Obama on being elected the 44th president of the United States. I’m gonna say what many others have been saying: I never thought I would see a black person elected president in my lifetime. I always thought a white woman or latino male would be elected before a black person would be elected president. I stayed up all night last night watching the election coverage. I was too excited to get any sleep. And today I continued to watch the post election coverage on CNN and MSNBC. I stood in line for about an hour and fifteen minutes so I could vote yesterday. I got to the school about 12:45pm and finally got to vote at 2:00pm. The line I was in was outside at first but then eventually it didn’t take long for us to get inside the school. From what I was told the line and wait was much longer earlier yesterday morning. The Democratic National Convention started in Denver on Monday. On Monday I watched it on our local PBS station. I then read that the coverage on C-Span was great if you didn’t want to listen to the usual talking heads that you see on CNN, MSNBC and FoxNews. So since yesterday I’ve been watching the convention on C-SPAN. They’ve been showing gavel to gavel coverage including the roll call today. As of this evening Senator Barack Obama has been declared the official presidential candidate of the Democratic Party. DENVER — With the weight of history hanging over them, Hillary Rodham Clinton and the Democratic Party formally chose Sen. Barack Obama as the nominee for the White House, elevating the first African American to that exalted post and putting a black man a step from the presidency. With a theatrical flourish, the roll call vote was rushed to allow Sen. Hillary Rodham Clinton to suspend the vote and “in the spirit of unity, with the goal of victory,” declare Obama the nominee by aclaimation. I’ve also been recording the convention since I do have a certain bedtime to meet. I just got around to watching the speech given by Michelle Obama and it was great. I know I’m late on this. The Senator who described presidential candidate Senator Barack Obama as articulate, bright and clean earlier this year, Senator Joe Biden, has been chosen as Senator Obama’s vice presidential running mate. New York Times columnist Bob Herbert has an interesting column titled Running While Black. Now I see why earlier this year Senator John McCain’s senior campaign advisor Mark McKinnon stated that he will stay on the sidelines if Senator Barack Obama won the Democratic presidential nomination. He didn’t want to go Lee Atwater on Obama. Apparently McKinnon left McCain’s campaign in May. Who am I talking about? Ludacris, that’s who. What in the hell was rapper Ludacris thinking? Have you seen the lyrics to his latest song? Check it out here at the Daily Voice. The track is titled Politics: Obama Is Here. Thanks to Ludacris, Senator Barack Obama had to denounce the lyrics to this song. Calling Senator Hillary Clinton the b word and his comments about Senator John McCain were totally uncalled for. Why do black folks do this? We are our own worst enemies. Unfortunately Obama has been photographed with Ludacris and has mentioned that the rapper’s music is in his ipod. Check out Najee Ali’s open letter to Ludacris. Ali is right. With friends like Ludacris, Obama doesn’t need enemies. Talk about giving ammunition to the Republicans and Hillary supporters who are on the fence. I guess now we’ll see a Republican attack ad using a picture of Ludacris and Obama together talking about this song. When will we learn? I doubt very seriously if an asian or hispanic person was running for president you would see a singer or rapper of that race doing something this stupid. Some folks are really getting desperate. Over at MSNBC I read an investigative report about former congressional investigator and conservative activist David Bossie desperately seeking a copy of Senator Barack Obama’s senior thesis from Columbia University. Journalists began hounding Columbia University for copies of the musty document. Conservative bloggers began wondering if the young Obama had written a no-nukes screed that he might come to regret. And David Bossie, the former congressional investigator and “right-wing hit man,” as one newspaper described him, took out classified newspaper ads in Columbia University’s newspaper and the Chicago Tribune in March searching for the term paper. According to a New York Times article last year Obama majored in political science at Columbia and had spent his time writing his thesis on Soviet nuclear disarmament. Plenty of folks have already railed against Michelle Obama for her Princeton thesis Princeton-Educated Blacks and the Black Community. Some folks called her an ungrateful black radical who should be thankful she got into Princeton. It’s obvious that these folks don’t have a clue about the history of Princeton University. I learned quite a bit after reading about the history of Princeton in Lawrence Otis Graham’s book Member of the Club. Lawrence and Michelle attended Princeton during the early 80’s. Anyway you can read the entire investigative article Obama and the case of the missing thesis here. 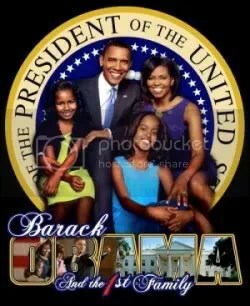 While checking out The Daily Voice I noticed a link that mentioned the Obama family opening up to People Magazine. The Obamas talk about raising their daughters Malia and Sasha. Also clear: That even on the campaign trail, this is a brood almost like any other, with set routines (chores! ), boundaries ($1 allowance!) and playtimes (movie nights!). The Obamas opened up to PEOPLE – first, at the family’s three-story home in Chicago in June, and again on July 4, at a park in Butte, Mont., where the family campaigned and celebrated Malia’s birthday – about the task of raising two girls, including 7-year-old Sasha, under the public eye. PEOPLE: Someone told me today that you don’t do birthday presents. Barack: That sleepover is enough. We want to teach some limits to them. And their friends bring over presents. So what does a slumber party at the Obama house look like? Michelle: The older they get, they just talk a lot. But they’re at the age where they’re pretty self-sufficient. [For Malia’s birthday] we’re going to go swimming, see Wall-E, make pizzas, have sundaes. Barack: I usually go for the swim but this time I want to go to the movie just because Wall-E has gotten great reviews. I find actually that children’s movies are the best movies these days. But I’ll probably, after that, peel off until the cake. You can read the entire interview with the Obamas here. Check out Robin Givhan’s column, Plunging Back Into Blackness. Robin talks about John McLaughlin’s comment about Senator Barack Obama being an oreo. Last week on “The McLaughlin Group,” a show so fusty that plumes of dust waft from the television screen upon the first note of its brassy theme song, a curiously retro word floated into the Sunday morning blathersphere: Oreo. McLaughlin’s decision to dredge up a race-baiting slur, which historically was intended to suggest someone was self-hating and inauthentic, had the feel of a 1,000-year-old blowhard trying to be provocative and clever. It was delivered in a tone that spoke of anthropological curiosity — as if he had been chauffeured past a crowd of black people 50 years ago, overheard them talking, and picked up a bit of their odd patois. The term oreo has been used as an insult by some blacks to describe a black person as black on the outside and white on the inside if that black person is successful, does well in school, etc. (Check out the term in the Urban Dictionary) Robin pretty much discusses how Senator Obama isn’t black enough for some (being Harvard educated) and too black for others (being a member of Trinity United Church of Christ). Despite McLaughlin’s stilted tone, it was yet another reminder that the question of Obama’s blackness — too much or not enough — refuses to be put to rest. Obama has ping-ponged between not being black enough when he was mostly known as the Harvard-educated lawyer who gave rousing speeches, to being too black when his now former minister Jeremiah Wright was on the loose preaching about a racist America. Now he’s back to not being black enough because he’s been talking about personal responsibility among black Americans. The debate has become absurd. When he plays basketball, is he blacker? Or, as the comedian Bill Maher joked: “He bowled a 37. . . . Is he black enough for you now?” And how about when he tucked in his polo shirt and went for a family bike ride? Was he only kinda-sorta black then? It would be splendid if the man could simply just be in the same way as presumptive Republican nominee John McCain. (No one’s asking if he’s too white or not white enough.) But we have not arrived at that mountaintop yet and so, in the meantime, Obama must serve as symbol and trope. He must represent his multiethnic constituency and he must represent. This is not a matter of skin tone. It’s about culture, sensibility and perception. While Obama’s ascendancy has brought many issues into the spotlight, one of the most confounding — at least for far too many pundits — is the notion of blackness, what defines it and who gets to determine whether the prevailing definition is correct. The July 10-24, 2008 issue of Rolling Stone magazine features presidential candidate Senator Barack Obama on the cover with an exclusive interview. His music tastes range from Bob Dylan, Miles Davis and Jay-Z to Sheryl Crow, Stevie Wonder and Charlie Parker. Bob Dylan. Yo-Yo Ma. Sheryl Crow. Jay-Z. These aren’t musical acts in a summer concert series: They’re artists featured on Barack Obama’s iPod. Growing up in the ‘70s, Obama said, he listened to the Rolling Stones, Elton John and Earth, Wind & Fire. Stevie Wonder is his musical hero from the era. The Stones’ “Gimme Shelter” tops his favorites from the band. The Illinois senator’s playlist contains these musicians, along with about 30 songs from Dylan and the singer’s “Blood on the Tracks” album. Jazz legends Miles Davis, John Coltrane and Charlie Parker are also in the mix. You can check out A Conversation with Barack Obama here at Rolling Stone.com or you can buy the magazine at your nearest bookstore, newstand or grocery store.